The #LBBill is an idea to change the law for disabled people so that they have more control over what happens in their lives. We need your help to achieve that. 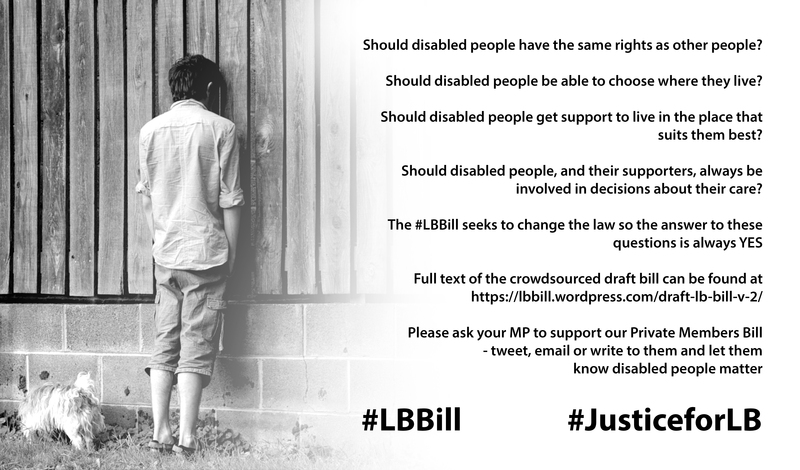 Please tell your MP that you support the #JusticeforLB campign and that you’re asking them to support a Private Members Bill drafted by the campaign. Please also explain that supporters of the campaign have come together to draft a Bill which would promote and protect disabled people’s right to live in the community with choices equal to others and the support they need. It has become known as ‘LB Bill’ in memory of Connor Sparrowhawk (who was known as LB or Laughing Boy). Your MP might like to know that the Bill is on its second draft and has had feedback from hundreds of disabled people, family members and allies. The Bill has mass support, as you can see on the campaign website https://lbbill.wordpress.com/supporters. It builds on existing legislation, including the Care Act 2014. Please add a comment to this post with your MP’s name (and their party and your constituency if you know it) once you’ve contacted them directly, this will help us keep track on how many MPs know about the Bill. If your MP replies and has any specific questions or wishes to discuss the #LBBill then they can email us at LBBillFeedback@gmail.com We look forward to the pledges of support flooding in. This entry was tagged 107days, Connor LB Bill, connor sparrowhawk, crowdsourced, disabled people, Justice for LB, justiceforLB, LB Bill, LB's Bill, LBBill, MP, Private Members Bill, Private Members Bill LB Bill, Sponsor Private Members Bill, Week 10, who is Connor Sparrowhawk. Bookmark the permalink. Request sent to Andrea Jenkyns, MP for Morley and Outwood, Leeds.